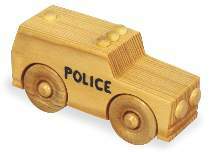 Easy to make, this little police car is cut from a scrap of 1-1/2" stock. Kids love them - so make lots of them! Pattern drawn FULL SIZE. Measures 4-1/2" long. Order hardware separately or see Special below. Police Car Hardware includes twenty 1-1/4" grooved wheels, forty 1-1/8"L axle pegs and twenty 1-5/8"L axle pegs. Enough for five cars. Project plan, remaining wood and wood finish not included. Police Car Special includes W3021 Police Car Plan and one #2034 Police Car Hardware Package.